Even though Arya is older, she still loves looking at high contrast images. The front cover of A Book of Sleep by Il Sung Na caught her eye with the bright, white eye of the owl against a dark, black background. Whenever my baby likes the cover a book she usually enjoys reading the rest of it as well. A Book of Sleep tells the story of animals going to sleep at night. Each page shows a type of animal sleeping through the night while a watchful owl with bright, white eyes stays up the whole time. By the end of the book, daylight comes and all the animals wake up. On the last page, the tired owl finally gets to go to sleep. Although the text is simple enough for older toddlers to read by themselves, the plot is cute enough to amuse even adults. The book is clearly designed to be read to babies as they get ready to go to sleep at night. Since every page shows a picture of an animal sleeping through the night, little readers will get used to the idea of going to bed themselves. The calming backgrounds and dark, muted colors of the illustrations also serve to help prepare little ones for bed. Arya really liked touching the huge, white eyes of the owl and the fish. She didn’t respond as enthusiastically to any of the other images throughout the book. Nonetheless, the combination of the pictures and short text were sufficient to hold her attention for almost the whole way through the book. 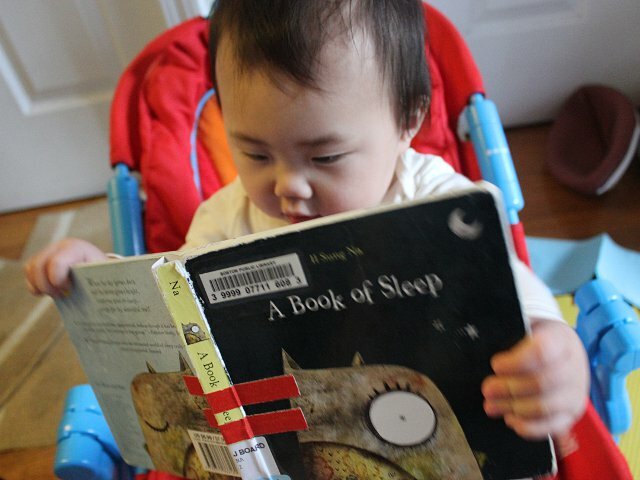 A Book of Sleep is a fantastic choice for a bedtime ritual. For nostalgia’s sake we use Goodnight Moon by Margaret Wise Brown for use at bedtime. But A Book of Sleep would be every bit as useful as a consistent nightly ritual. A Book of Sleep costs (including shipping) under $7 new and under $5 used from Amazon.